Less than one week after announcing plans to get into home broadband, T-Mobile has revealed that it’s jumping into another market. T-Mobile GoPoint is a new mobile point-of-sale system for small and medium businesses. Using a smartphone or tablet connected to a T-Mobile One plan, GoPoint allows you to accept payments as well as manage sales transactions, track inventory, and get analytics, and it works over Wi-Fi or the T-Mo network. T-Mobile is teaming up with global payments provider TSYS to power its GoPoint software, transaction management, and same-day funding. GoPoint charges 2.75 percent for debit and credit card transaction processing. To compare, Square starts at 2.5 percent plus $0.10 while Clover starts at 2.3 percent plus $0.10. Well-qualified businesses can get same-day funding, and there’s no software licensing fee. If you ever need help with something, GoPoint offers live technical support is available 24 hours a day, 7 days a week. And finally, one GoPoint subscription works for up to 99 employees, so you don’t need multiple subs for a small business. There are two versions of GoPoint that will be available. 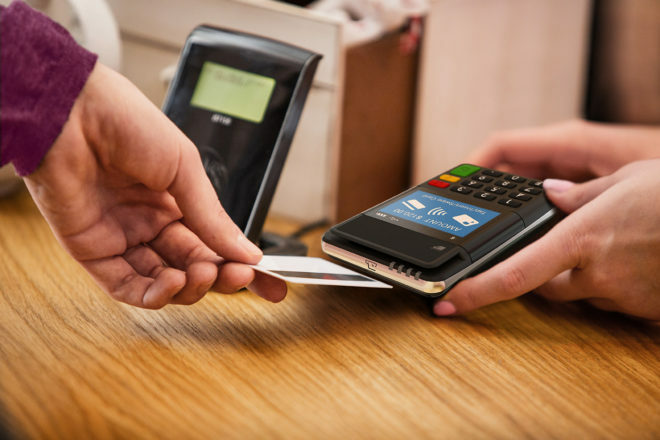 The standard GoPoint can be used on compatible Android and iOS smartphones with a GoPoint card reader and accepts magstripe and chip card payments. Stepping up to GoPoint Pro will give you tablet support, enable you to print receipts, and get you extra features like inventory management. GoPoint Pro works with Android tablets at launch, with support for iOS tablets arriving in the coming year. Pricing starts at $25 for a GoPoint card reader or $180 for a GoPoint card reader with a display. Transaction fees are 2.75 percent for magstripe or chip payments or 3.5 percent plus $0.15 or manually keyed transactions. Optional add-ons include a $60 card reader cradle, a $308.77 receipt printer, a $103.79 cash drawer, a $245.15 barcode scanner, and a $5.09 generic cable for a cash drawer. GoPoint for smartphones requires a T-Mobile One plan. If you step up to GoPoint Pro for a tablet, you’ll need either a T-Mobile One plan or a mobile internet plan with at least 6GB of data. Also announced today is the T-Mobile for Business Marketplace, which offers mobile device management and productivity software. Small and medium businesses who enroll in T-Mobile for Business can get help from Marketplace Advisors with things like choosing software such as Microsoft Office 365, Intuit QuickBooks Online, DocuSign Business Pro, IBM MaaS360, and VMware AirWatch Express. Businesses can also get 24/7 support and a free year of QuickBooks Online Simple Start or Essentials via up to $35 per month discount when they add four voice lines of T-Mobile One service. So let me get this straight. We have time to created (re-brad) a T-Mobile Credit card that no one asked for and went defunct after a year, then create(re-brand) a T-Mobile checking account that has less features than Ally and Capital One 360, and then create(re-brand) a card processing service, But my flagship Samsung phone still has January security patches (in Mach) and is running Android 8 (Android 10 beta has been released). T-Mobile Please take care of your mobile business first! New ventures last! What phone u have,I have Note 9,it was updated to pie. Just wondering,because what read on here most all flagship phones got the update. I still waiting for update for Guitar Hero,no I didn’t buy one,will buy one on ebay,when the update comes out. LoL. Mmmm,it eol long time ago,Tmo didn’t said word about it when it did. LoL.